The CIP® Output Plug-in enables the Fusion Harlequin® RIPs to produce Print Production Format (PPF) files containing information about print jobs, including administrative data, information about inks, and preview images. The PPF file is then read by a CIP reader at the printing press control systems, which provides instructions for automatically setting ink fountains on the press. PPF file generation through the Fusion RIP is just as easy and automatic as generating the plates and films themselves. Integrating these files into your press can bring you to color far faster, while reducing make-ready time, wastage and the need for plate scanners. • Positions and colors of color test strips, allowing automatic setting of closed loop adjustments on press. • Positions of registration marks, allowing automatic setting of registration test meters on press. • Positions of fold and cut marks, allowing at least preliminary setup of post-press operations to be handled automatically. The term CIP3 stands for the International Cooperation for Integration of Processes in Pre- press, Press and Post-press. CIP3 is an international standards body whose purpose is to encourage computer-based integration of all processes involved in graphic arts workflows by specifying and publishing standards. CIP4 is the successor to CIP3, which started in 1995 as a joint initiative of vendors for the graphic arts industry. The current focus of the association is on the development and adoption of the JDF (Job Definition Format) Specification, which incorporates the existing PPF format. 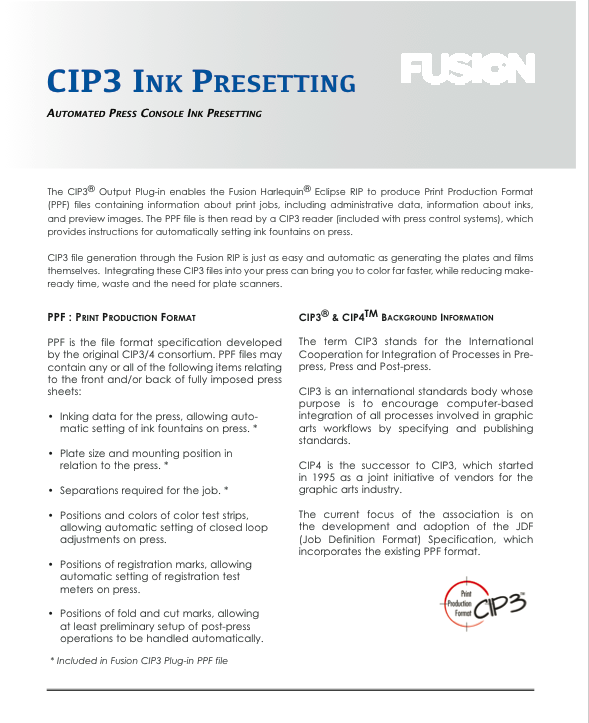 Fusion Systems' CIP3 automates ink-key settings greatly reducing make-ready times on the press. This eliminates paper waste and the need to manually adjust ink zone coverage. CIP3 produces a PPF file (Print Production Format file) that is fed directly in to the press controller. When the PPF file provides instructions for automatically setting ink fountains on press. The production efficiency gained by deployment of this software is dramatic, and often results in the ability to print more jobs within a given production shift. Speedmaster SM/CD 102, Speedmaster XL 105 and vintage machines (MO). Call 503-261-7395 or email us at Workflow@FusionSystems.com for information regarding exact press controller compatibility. Other Ink Pre-Setting solutions available as well for other workflows and press models.